Launch Day for the Partners in ParanormYA! Thanks, Alex, for hosting Partners in ParanormYA for today’s all-important launch. Here at mission control, we’ve completed the basic go-no go checklist with authors Angela Brown and Gwen Gardner. First, second, third and fourth rounds of drafting, rewriting, and revising completed. Manuscripts had to be pried from their OCD-edit hands – both Angela and Gwen – but that section completed. Plans are in place to make sure Angela hasn’t nervously chewed her fingernails down to the nubs. *giggly voice cuts in*: I can’t believe it Gwen. Launch day is here! Gwen *sighing*: You know, it’s good to finally leave the streets of Daydreamer and round the corner to Dream Realized. Gwen *joins the giggles*: OMG, Angela! There’s no farting at launch time! Angela: We probably should have done a go-no go for extra underwear. I may need them. Gwen and Angela burst into laughter. This is PIP mission control. Your mics are hot, ladies. I say again, your mics are hot. PIP Mission Control: Back to you Alex for the final countdown as it appears the ladies are a bit excited right now. If you wouldn’t mind doing the honors? PIP Mission Control: Engines fired and they’re off. I repeat, Angela Brown and Gwen Gardner have now thrust Neverlove and Givin’ Up The Ghost into publishing space. All of you are invited to use live links to purchase your copy today to make this launch a success. You can also enter to win in the Partners in ParanormYA weekly giveaway along with the main swag giveaway located at the PIP headquarters. 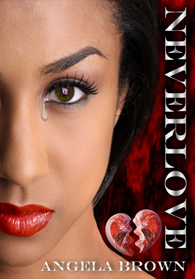 Purchase Angela Brown’s Neverlove at Amazon US, Amazon UK, Barnes and Noble, Amazon FR, and Amazon DE. 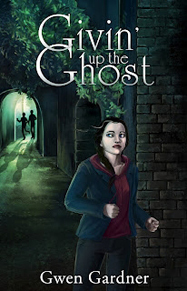 Purchase Gwen Gardner’s Givin’ Up The Ghost at Amazon US and Amazon UK. And there are two giveaways! Visit Partners in ParanormYA for the Big Swag Giveaway and for the Week One Giveaway! 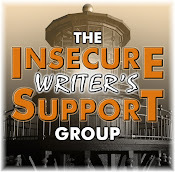 A big thanks to everyone who offered to help co-host the Insecure Writer’s Support Group. My plan is to make this a rotating position, so watch for new co-hosts every month. The latest issue of White Cat Magazine is out! And Rick at The Writer and the White Cat was awesome enough to include a BIG ad for both CassaStar and CassaFire as a thank you for what I do in the blogging world. Thank YOU Rick – you rock! Retro-Zombie Jeremy interviewed the composer of the movie Looper at Howling Wolf Records. Really interesting how he put it together! Jeremy is also hosting a five hundred follower contest at his blog, Retro-Zombie, and he’s THIS close to hitting five hundred!!! Jamie at Mithril Wisdom is celebrating his birthday in Hobbit style – he’s giving away presents! Check out his site for the giveaway and the birthday dragon. Happy birthday, Jamie! Authors Nancy S. Thompson and Jennifer Hillier sent me this picture from BoucherCon! Is that not awesome? I just adore both of those ladies. Sheena-kay Graham is hosting a Blogoversary: Sacrifice Book 4 Bloghop on October 25. Visit her site for details and to sign up. Congratulations on one year of blogging, Sheena-kay! Kyra Lennon’s new book, If I Let You Go, is available on Amazon now! Congratulations, Kyra. Milo James Fowler at In Medias Res is celebrating this month with Creepy Freebies! Visit his site for this week’s free book. And congratulate him on the placement of two more of his short stories. Miss Jack Lewis Baillot’s new book, Lisbeth’s Choice, is available now. Congratulations, Miss Jack! 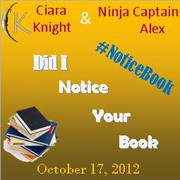 And don’t forget the Did I Notice Your Book Blogfest is October 17! For the first time ever, they are allowing fans to vote – and RUSH is on the ballot! For those who don’t know, the Rock and Roll Hall of Fame is privately owned by a man who hates the band Rush and claimes he will never allow them to enter. Well, now we can change that! So go HERE to cast your vote for this highly influential progressive rock band. Picking up Angela and Gwen’s books? (Don’t forget the giveaways.) Don’t forget all the new books, magazines, and contests this month. Get the trivia correct? (Second one was tough, wasn’t it?) And did you see any good movies this weekend? I finally watched my 3D Bluray of The Avengers – what an awesome film! I'd never heard of White Cat Magazine. Egads! More to read! Hey, Alex. Jennifer Hillier was here in Manila but we missed each other. I did get a pic of her latest book on an end cap at the national Bookstore. What, no Wednesday post (holds heart)? See ya next post then. Cheers! Congrats Gwen and Angela! Hilarious post guys. :D Have a great blogfest! And thanks for the news Alex, see you Friday. So excited for Angela and Gwen. Happy Release Day! And what a fun post about it. Thanks for all the great news ALex and congrats to the giggly twins on their new release! Who has time to go to the movies with all this great stuff on Tv this fall. Have a great week! Thanks so much, Alex, for hosting us and for "intervening" in the countdown since we we were in the throes of excitement and giggles. I knew I recognized at least two of the movie trivia (The Fly and Nightmare on Elm Street) but I couldn't think of the movie names lol!! So many great pieces of news going on around the blogosphere. Congrats to Kyra Lennon and that's cool what White Cat Magazine did. Happy Birthday to Jamie. Going over to check out what's happening. Thank you to ALL who decide to pick up a copy of any of the books or magazine mentions in this post. You all rock! Thanks for catching us up on the news! Congrats to Gwen and Angela! Thanks for the links! Have a great week, Alex! Jeremy, sorry you missed her. And yeah, little bit of a break this Wednesday. Siv, there is always time for a movie. Angela, very happy for you and Gwen!! Honored to be a part of your launch. Elizabeth, go tell him NOW!!! Hi Alex, Thanks for all the links info. I'm intrigued by 'Did I Miss your Book'? I only just watched Nightmare on Elm Street last Friday and enjoyed the artwork immensely. It will be very interesting to see what happens this year with the fan vote - I've seen people promoting Rush all over the internet. Great post will be checking out the links! WOW on the first ever fan vote on the R&R Hall of Fame. Can't wait for hubby to get home, he is a Rush fan. Years ago he went to one of their concerts. Hmm, re-watched TAKEN - just as good as the first time - and JEEPERS CREEPERS 2, which is really not bad for a sequel. Also saw, IN THE DARKEST HOUR - not great but not bad. Dude hates Rush? That's just... bizarre. And stupid. Well, unless someone in the band ran over his dog or something, then I can see it becoming personal. I did see Looper: Awesome. One of the best movies I've seen this year for sure. Hard to compare flicks, but I was probably moved more while watching that than I have been in several years. 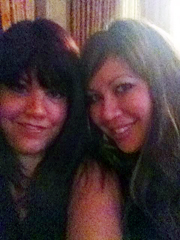 Aw, aren't Jennifer and Nancy cute? :D Lisa Regan was there too. Nice way for friends to meet up. And I read one of Milo's short stories he's giving away. Good, creepy read for Halloween. Or anytime, really. So many authors with new projects. Congratulations and best wishes to them all! I'm glad you found some co-hosts. 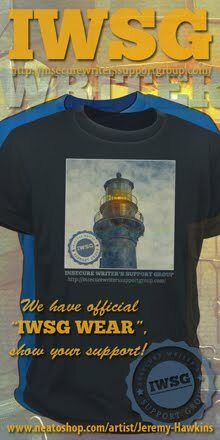 IWSG is a big group. I made it to about 25-30, and am still responding to the very sweet folks who encouraged me. It's a good thing you're doing there. It was just what I needed so THANKS. Very glad you got some free ads for all you do - well deserved! I did 'n know a one of that horror trivia. Ha, ha, ha. Madeline, it was your first time to see it? Gossip Girl, get him to vote! And won't tell you how many times I've seen them in concert. Rusty, yes, it's stupid! And agree with your assessment of Looper. Told you - smart science fiction at its best. Tina, thanks! And the help is very much appreciated. Wow, so much great news. Congratulations to Angela and Gwen. Wishing you many happy sales, Kyra. Although I've seen all the movies listed, I was way too young to remember any lines from AWIL. What a lot to read about today. The giveaways sound great. Thanks for all the info! Happy Monday! I have to give Angela and Gwen kudos, I don't know the dynamics of co-writing, but I can see my Bestie and I spending the vast majority of our time in stare down contests over a scene we don't agree on. Best of luck ladies!!! Oh and Alex, I would help host the ISWG, but I'm not secure enough. Yeah...that probably qualifies me doesn't it? Congrats to Angela and Gwen . . . I need to get back to my blog and update a part of it for them today. Congrats to you Alex for the White Cat shout out! Congrats to Kyra, and Miss Jack, and Happy Birthday to Jamie! And a interview ith the composer of Looper - very cool. Saw Looper this weekend, and it was thought-provoking and slightly disturbing but good all at the same time. Lots happening in the world of Blogdom! Its great to see all these Blogfests and new releases. Just goes to show how much the world of publishing has changed these past few years. Seeing self published authors in the NY Times Bestt Sellers list is becoming more common these days. Penny? Penny the Modest internet star!??! Penny the wonder dog!?!? Voting for Rush! They rock! So much information! I have to read through the blog again to make sure it all sinks in! Great post Angela and Gwen! Sorry Alex, but my vote is for Deep Purple (I know them better), but Rush still has much advantage. I love announcements from Mission Control. What can I say? I am a sucker for authority figures. Congratulations to both ladies! That is exciting! I'm going to look into the books, I like the covers a lot. Oh, now I know why I didn't know the lines from those movies...never seen any of them. My mum watched Nightmare on Elm Street a lot though. Did you see the gag reel on The Avengers DVD? what a great launch! awesome & fresh! great stuff! thanks for the info! Congratulations to Angela and Gwen!! So excited for them. Wow, I didn't realize Rush had been excluded from the Hall of Fame. That's crazy! Good luck to Angela Brown! I like the picture with Jennifer Hillier. Oh, Nightmare on Elm Street was so scary. I was scared to fall asleep after seeing it! Rose, I bet you will. Hilde, that makes you an expert on the subject! Tyrean, it did have a couple really disturbing moments (vanishing fingers and more) but Looper was excellent. And was very excited about the White Cat opportunity! Kitty, that's correct - Penny! Leovi, Deep Purple should be in there as well. Jack, you are welcome! And didn't have a chance to watch the gag reel yet. All kinds of great stuff here! Congrats to Gwen and Angela - enjoy the ride! I'm starting to think I should be writing paranormal romance. I also got the Avengers Blu-Ray--and can't get enough of it! Congrats on the ad in the magazine. Alex, thank you for the shout out... you are my internet brother, the interview was an awesome experience. I hope to bring some better and cool stuff soon. Hell Yes on Rush... I still haven't heard the latest release.. Best of Days to you! Norma, doesn't the Bluray rock? Roland, no! And I PROMISE I will finish Legend this week. Jeremy, you're welcome, and just go vote for Rush anyway. Lots of happy news and I love it. My answer to the trivia question was sooo far off! The Dracula quote threw me. I thought I knew all of the lines. Was this Bela Lugosi? This post is overflowing with successes and exciting news. Whenever I need inspiration, I just need to drop by here. I don't know Rush's music, but I'll place a vote for them - to spite the guy. Can we vote more than once? I have most of the day free, Alex. Wow, what a lot of exciting stuff here Alex. I think I'll be spending a lot of time here - I have the day off and want to dedicate it to catching up on blogging. (I can't believe I missed your IWSG post; I got so busy with others I forgot to stop by.) My google reader is getting so full its too intimidating to look at. Gwen and Angela's post was awesome. Laughing at the PIP interview. Congrats to both ladies! Thank you so much for posting my bloghop Alex. Glad Givin’ Up The Ghost is out and Nightmare on Elm Street is a horror classic. Man! That was so much stuff I lost track of it all! Teresa, so good to hear from you! Nancy, you focus on your book for the next month and maybe help after that. And I thought you both looked awesome in the photo! Leigh, no - Gary Oldman in the 90's Dracula. Robyn, thanks! You can vote from every computer or electronic device possible. Congratulations, Gwen and Angela! I LOVED this launch day post. It perfectly captured your insane excitement at having finally reached "Dream Realized"! Congrats to Angela and Gwen! American Werewolf was such a good film. I wonder if the effects hold up. I'm pretty sure Jenny Agutter's shower scene does. Lots of great news this week! I still didn't get to watch a movie this weekend, but maybe this week? Rachel, they did capture it, didn't they? Moody, now I want to check and see! Congrats to Angela and Gwen! I just bought their books, and I can't wait to read them! I watched the Avengers again this past weekend. LOVE that movie! What fun to promote the giddy duo's book launch! Hoooly cow that's a lot of Ninja News! Yes, Gwen and Angela do giggle a lot. :D Nothing wrong with that, though. And at least I got two of those trivia questions right, lol! I'd heard that earlier about laypeople voting for the Rock and Roll Hall of Fame nominees. It's not right how Jan Wenner allows his biases to keep deserving artists out, while quickly ushering in people of questionable talent as soon as they're eligible. It's hard to believe Paul Butterfield, Jone Jett, Deep Purple, Albert King, Procol Harum, Rush, Randy Newman and even Donna Summer aren't all ready inducted. You crack me up, Alex! I had a kick reading that launch! I'm so happy for Nancy! She had so much fun and it makes me smile knowing it. Wow, lots of things to check out. I didn't get any of the trivia but I always try. Yay for Gwen & Angela!! Glad launch day is finally here for them. Awesome. Thank you everyone, for your kind words and support. Angela and I appreciate each and every one of you! And thank you Alex! You are the awesome ninja captain! I'm looking forward to the DINYB blog hop! I've got Angela over at my blog Friday. I'm looking forward to it. Have a great week! I failed the trivia. Horror and I do not get along at all. I can see 3 seconds of a trailer for a scary movie and I will not sleep for weeks. I have to shut my eyes and plug my ears. I'll have to go check out those giveaways. Thanks for the heads up. A huge congrats to Angela and Gwen!!! Okay I vote for the R & R Hall of Famers. I'm surprised Rush and Deep Purple hadn't already been nominated. A travesty. ROFL!! Probably best LAUNCH day post EVER! Livia, I am here for your amusement. Julie, she will be with us Friday! Gwen, just wanted to launch you in style. Lee, that's what happens when one individual controls it. Grr! The Fly...that's the one that I couldn't remember! LOL! Brundlefly, bleh. Too much good stuff -- and thanks for the shout-out, Alex! So happy for the LADIES! Congrats on their launch! I also watched the Avengers this weekend! Just as good small as it was big! I may watch it again tonight! Reading? What's this reading you speak of. I think I get in two pages before falling asleep. Lot's of news today. And congrats to Angela and Gwen! What a cool cover Angela. Hope you and Gwen have a great send off. "Modest internet star"? Definitely looking forward to that post. Angela and Gwen. Oh my, now there's a giggly combination. Oh, Rush gets my vote! "The Fly" ah yes, be afraid. Be very afraid of the original film and the acting of Vincent Price. "Help me! Help me!" And a modest internet star will grace your blog with her presence. I'm intrigued and I shall just have to wait. Another action packed posting, Alex. Thank you. Raquel, most people missed it. Heather, because once is never enough. Sia, the ladies have great smiles! Golden, you will enjoy it! Gary, you rock! And yes, this modest Internet star will rocket to spectacular Internet star on Friday! I've been delighted to see Angela's and Gwen's launch news on several blogs today. Congratulations again, ladies. Congrats to Angela and Gwen! How exciting! Also- loved reading about all the other great news out there in the writing world. I had no idea the Rock and Roll Hall of Fame was independently owned. Good luck RUSH! Spooky movie quotes! I knew three out of the five. Ya know I thought Rush was already in the HOF. What is the backstory on why the owner hates Rush??? Allowing one major influencial band to be left out because of a personal grudge or whatever it is kind of makes you wonder who else he will never let in...and that just taints the whole concept of a HOF. BTW, going to Ohio for Christmas and the HOF is on my agenda...haven't been since it first opened. Looking forward to it. I've seen all those movies and didn't get one question right. So much news the mind reels. Yay for Angela and Gwen. I actually got the ones I guessed right! And Rush is in the lead. Very cool! Congratulations Angela and Gwen. So happy for the both of you. I'm getting your books pronto! Congratulations, Gwen and Angela! What a clever way to launch. "Your mics are hot, ladies. I say again, your mics are hot." DMS, yes it is, which isn't right. Chuck, it taints it all right. It's not like the Football Hall of Fame - it's one guy making the decision. Jamie, you're welcome, and most people missed that one. Carrie, I'm blessed to have the friends I do. Melissa, thus all the giggling! Congrats to Angela n' Gwen! So much happy and exciting news. Thanks for sharing all of this with us, Alex. Angela and Gwen - you rock! Thanks for letting me catch up on all this great and happy news. My head is spinning from all the news. RUSH always gets picked over. I'm betting that this is their year. I swear, Nancy not only doesn't look old enough to have a college aged son, but really, does she look a day over 14??? I HAVE to watch more movies! I stink. Best of luck Angela and Gwen! Congratulations, Gwen and Angela! That was a fun post. Congrats to Angela and Gwen! I always miss your cool trivia's! Got to get over her more regularly! :D Thanks for all the updates, Alex! Jay, it better be their year. Joylene, she does look young, doesn't she? We're about the same age. That quote came from THE FLY?? Oh, how I loved that movie. Can't believe I couldn't place it. Wonderful that you have so much Ninja News to report! Congratulations to the Paranorm YA authors! Yes, they really are lovely Nancy and Jennifer, very pretty. Greetings. Congrats to everyone with releases! How exciting! I had the pleasure of hanging with Nancy and Jenny over the weekend and they are truly fabulous ladies. Alex, I'm not sure you 'do' blog awards, but I've given you one anyway. Wow, that was quite a launch. And who better than the Ninja Captain as controller! Good luck to the two space cadets! And congrats to everyone else with good news. Chuffed for Kyra. If I Let You Go is a sweet read. Blimey - what a great...erm... interview! Gave me a good titter... "no farting on launch day" - that'll stay with me for ever!!! Randi, I try to keep up with everyone! Lisa, I saw the photos - I am envious. Patsy, thanks - I saw it! Nick, the girls did it well. So much info in your posts, Alex--thanks! That was an extremely fun guest blog. I like the whole "Mission Control Launch" angle. I actually hadn't heard of White Cat until reading this post. I'm off to check it out :) Thanks as always for being such a supportive person, Alex. No wonder I didn't recognize those movie lines - I can't handle horror! Haven't seen them! Congrats to Angela and Gwen. Love their post. Very clever! Congrats to everyone else on their good news and milestone achievements. What an original and fun blast off for Gwen and Angela! Thanks for the links, Alex. your blog has turned into the center for blog. writer and book news. Not sure how I feel about that. I watched the remake of Footloose on DVD over the weekend. It was okay, but I missed Kevin Bacon. Michael, it's a great magazine. Patricia, it's too many degrees from Kevin Bacon to be good. Congrats to Gwen and Angela. I hope to read their books. I love reading book news. I know to come here for the highlights. I'm so excited to participate in Angela and Gwen's paranormal duo releases! hahaha . . . you guys are so funny! I will be reading these books:-) My fam already watched Avengers 3x on DVD, ALex! Congrats to Angela and Gwen!!! I've never heard of White Cat Magazine, but congrats on that Alex! Congrats to Gwen and Angela -- how exciting for them and us readers. And Alex, I love your phrase, "manuscripts had to be pried from their OCD-edit hands." Been there. Congrats to Angela and Gwen and I hope their launch is successful! Cally, be happy to mention it. I am supposed to come up with ten horror movie trivia questions for our local theater's showing of Psycho. I believe I will go ahead and steal these five from you! So thanks! Yes! Rush! Sorry, all your other news is exciting too, but Rush! They're playing Montreal next Friday! Wow Alex, I seriously need you to write me a how to get my life in order book. You do it all. you read, write and blog like a machine. I'm in awe. And also, thanks for the book recommendations. I'm getting Angela Browns. What a great launch! Thanks for hosting it, Alex. Gossip Girl, the guest star is awesome! If I can get last minute tickets! I've been holding out, cos they're over 80$ each! So many new books out! But I will not take part because I own copies of the two books. I need to limit my visits of other blogs because my old laptop is slow. so many great books releasing! IT's awesome. No great movies this past weekend, but this week, oh yea! Can't wait til the 17th! Hope your week has been fantastic and the weekend even better to ya! Thanks for stopping by to celebrate with us, Alex. And double digit thanks for the big shout out on Friday! Magnificent, White Cat Magazine has done well with you. Laura, you didn't miss it. Thanks for sending the photo, Jennifer. Be cool to hang out with you ladies. Edi, need to get your laptop some new hamsters to run it. Lynn, it will be done! Congrats to Gwen and Angie. And thanks for those amazing links. Nobody's more organized than you are, Alex! Angela and Gwen were a kick! Good luck to them on their launch. I had no idea the R&R Hall of Fame was privately owned. Hrm. That sort of changes things. We bought Avengers on Blu-Ray and watched it, too. I've rented The Raven and hope to watch it tonight. I'm intrigued by that window of time before his death where no one knows where he was or what happened to cause his death. What can I say? I love a good real-life mystery! I loved the dialogue between Gwen and Angela and PIP mission control. "Your mics are hot, ladies. I say again, your mics are hot." A modest Internet star? I'm so intrigued! Shannon, it is, which negates some of its status to me. Kimberly, you'll find out tomorrow! Huge congrats to Gwen and Angela! Their books look great! Haha, adorable joint launch, Angela & Gwen. And my goodness that IS a lot of major Ninja news. How many stories does Milo have published now, 8 million? The launch post totally cracked me up! Best of luck to the both of them!! What great ninja news, Alex! I'm so happy for Angela and Gwen. Their book covers look fantastic! Congrats to Angela and Gwen!! So many awesome things are happening around the blogosphere. October is a fun, busy month! I got four out of five on trivia. Yes, I was honest and did not look here first LOL. On my way to vote for Rush. Melissa! Glad you're back. Thanks for voting for Rush. Congrats to Angela and Gwen. I've been looking forward to Neverlove since the A to Z Challenge. RUSH is killer - that's awesome. Lots of exciting news, congrats to everyone. Thanks for giving a shoutout to the Retro-Zombie blog--I'm a new follower of a hip new zombie hangout (new to me, lol). As of this very moment, he's only three followers away from hitting 500!! Have you been up there to the RnR HoF?